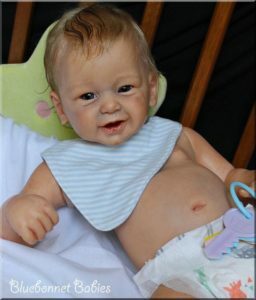 Why I Stopped Browsing Reborn Baby Images. When I first joined the reborn community, one of the things I loved to do was search images of Reborn baby online. This would give me idea of babies that I may have wanted to get as well as seeing everyone elses beautiful babies. In the beginning when you would search for reborn baby, you would see picture after picture of beautifully painted babies. Now if I type reborn baby into my search bar what do I get? Picture after picture, page after page of Chinese factory produced certainly not one of a kind dolls. You know, the kind of doll you could pick up from your supermarket. And this has been growing more and more, making finding pctures of genuine reborn babies more difficult. Due to this I have simply stopped looking now. It makes me both angry and sad to see that this has happened. Most of the time the dolls do not even have names, just numbers to identify which baby it is. This is not the community, these are not reborns. In fact I do not know what you can call them, but you certainly can not call them reborns.